One of the lessons I teach at my #Fit2FortyandBeyond workshops is to move more. I tell my participants to start what I call: “Exercise Dating.” When I started my fitness journey in 2011, I did not exercise at all. I’ve had this habit of talking walks in the morning around my village to clear my head. I’ve been doing that since I started writing 18 years ago. It has always been more for my mind than my body. I’ve always just dabbled here and there in a few exercises from Ballet to Tennis to Yoga to Mat Pilates to Wall Climbing to Reformer Pilates to Ultimate Frisbee to Water Aerobics to Bhangra Aerobics. Yes, I’ve tried them all. But they were always not sustainable exercises. Either they are too expensive to sustain, or too difficult to find a class I can attend, or just something I don’t enjoy. The last time I joined a gym many years ago, I paid for the annual fees for Fitness First but only went to the gym for a total of four times. I learned that the P8,000 annual membership fee, made for the most expensive towel, backpack, and water bottle I had ever paid for. So signing up this time with Gold’s Gym, I wanted to truly get into the habit of going to the gym regularly. Luckily, I discovered I enjoy doing Zumba classes. It is a forgiving class that lets you move with easy to follow steps. It helped that the teachers often dressed in happy Zumba colors. I instantly felt like I had walked into a flashmob and joined their production number. It is my dream to be part of a flashmob, so Zumba classes were sort of allowed me to live that dream. Eventually, I found a Zumba Instructor who I enjoyed dancing with and laughing with. When that happened, I looked forward to going to classes. Because it was so much fun, I didn’t notice I was moving a lot, gaining more stamina, and losing weight. It didn’t matter that I was not a good dancer, as long as I moved. 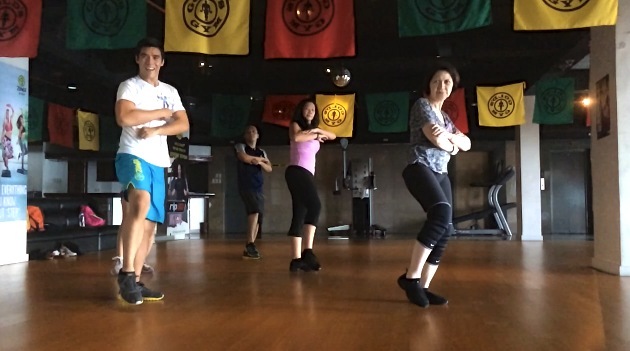 I could easily do two back-to-back Zumba classes because I was having fun. Before I knew it, I was showing up to the gym six days a week. Why is it important to find the right exercise for you? Because when you do find it, it won’t feel like drudgery. It will be fun and you will stick to it. You can afford doing this exercise long term. It’s not a one shot deal. It is easily accessible. Choose a place close to your place of work or home. If it requires a long drive or negotiating traffic to get to, chances are you won’t attend the class. Your teacher inspires you and motivates you to move more. The exercise is suitable for your body (It’s not to difficult that you will get injured, nor is it too easy that you are bored). There is a gym a few steps away from my home. With Manila’s horrendous traffic, it made sense to join this gym. But after trying their classes for a week, it was just not a match for my energy. The classes were too boring and did not make me move enough. I barely broke into sweat. Similarly, I’ve had classes with teachers and trainers in my current gym who can make one hour feel like eternity, think dog years! But with the right teacher, an hour goes by quickly. I no longer do Zumba today. I now do MixxedFit, a fitness program with explosive dancing and boot camp training. It is more intense and challenging than Zumba. I also do Piloxing Knock Out. Definitions classes (weight training and toning), Spinning, and Boot Camp classes. Just like romantic dating, finding the perfect match in exercise dating can be challenging. Each person is so unique in his/her likes, physical strengths, music type, the setting they prefer to workout in, and the type of teacher they like. But have faith, there is one suited for you. Recently, companies like KFit and Guavapass allow you to workout in different clubs for a fixed monthly fee. I’ve only tried KFIT. How does it work? When I signed up, it was P995 per month allowing you to take 10 classes on your fitness pass from a numerous selection of gyms and clubs like Bikram Yoga, Yoga Plus, Barre3, Beyond Yoga, Cross Fit, Elorde Boxing, Pole Dancing, and even Trampoline Park. This works really well if you just starting on your fitness journey and are still looking for the exercise that you enjoy doing. 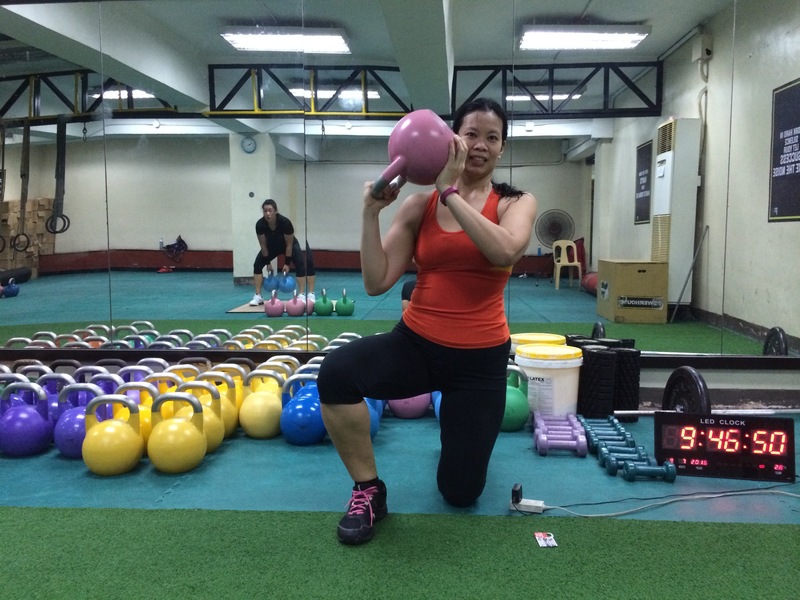 Paolo would match the weight and size of the kettlebells with the student. I have to admit, it was amusing to watch the muscular guys next to me lift their pink kettlebells. “Real guys carry pink kettlebells,” I teased them. They laughed. Paolo told me he trained in Russia. While I told him, I would return. I haven’t been back. If you are serious with your kettlebell exercises, this is a great place to train. Not only do they have all the colors and weights of kettlebell, this guy knows his kettlebells. I’ve also tried Barre3. It was the most convenient as it was across the street from where I lived. A Barre3class usually costs P700 per session. The KFIT description says, “It follows a vigorous pace moving through a sequence of posture designed to shape and lift the entire body. It is a mind and body program that combines isometric holds, dynamic movement and recovery stretches.”It involves a ballet barre and exercises that make your core tighter as your knees shake. I tried this twice, but haven’t really found a Barre3 teacher I enjoyed working out with. I’ve also tried Curves, again also a few steps away from my home. This Ladies Only gym offers 30 minutes sessions using hydraulic resistance machines. While it is clean and the trainer who leads the workshop is perky, it just wasn’t for me. But one gem I found from my KFIT membership is YOGAPLUS. I’ve long searched for a yoga studio suitable for me. I found it in Yoga Plus in Ortigas. It is clean, inviting, and exudes a friendly setting. There I attended the Vinyasa Flow class of Cookie Pido. Yoga Plus has monthly themes like Mindfulness, Grounding, and Journey. Cookie takes them to heart. She is also very authentic and accessible, making newbies like me feel comfortable. Cookie is conscious of special needs and injuries of students. Every visit to YogaPlus, I leave feeling refreshed, energized, and at peace. With clean showers, lovely facilities, and efficient staff, it is an urban oasis I enjoy going to. To be honest, I’ve only maintained my KFIT membership for classes at Yoga Plus. On most days, I still attend classes with my favorite instructors at Gold’s Gym. So it’s whether your are a newbie to fitness or hitting a plateau, it’s time to start dating… I can’t promise you will find your true love. But my wish for you is this: May you find the perfect exercise for you, and may you enjoy sweating on your fitness journey! *I paid for my own KFIT memberships. If you wish to try it too, I am sharing my discount code below to help you on your exercise dating. For those interested in joining a FIt2FortyandBeyond Fitness Workshop, I will soon be releasing FIt2FortyandBeyond’s E-Book/OnlineWorkshop and online coaching, drop me a line at [email protected] You’ll be first to know the details.